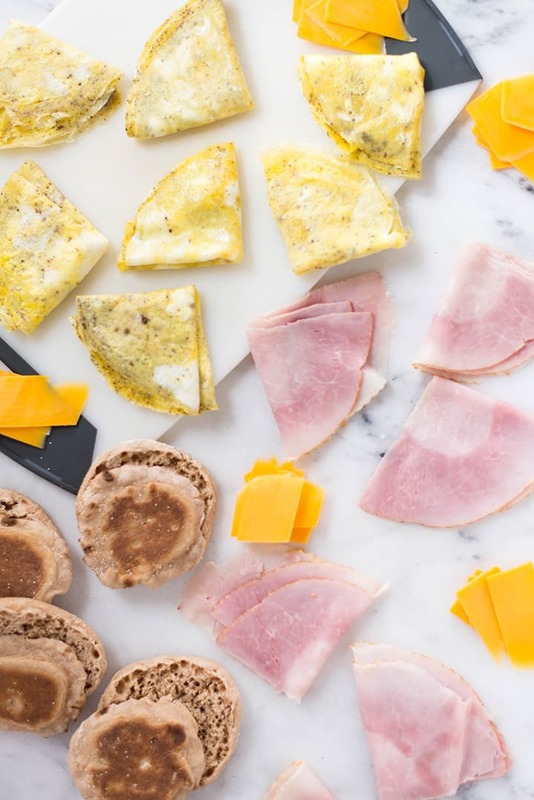 These Make-Ahead Freezer Breakfast Sandwiches are easy to make, healthy, and perfect as a grab and go breakfast during busy mornings. You know how much I love my make ahead meals. 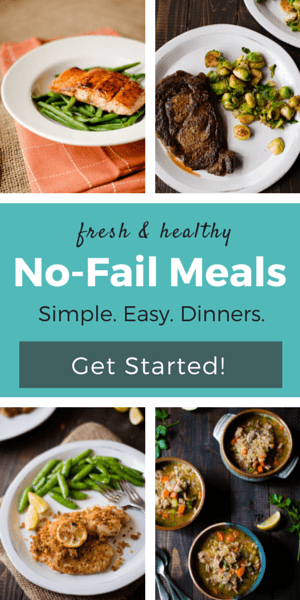 They save me a lot of time and they allow me to eat healthy all the time. However, when I say make ahead meals, most people think I’m talking about dinner. They couldn’t be more wrong, my friends. I love to meal prep every single meal. Yeah, and that includes lunch and breakfast. I actually believe that breakfast meal prepping is more important than dinner meal prepping. Before you label me as weird, hear me out. People are more tempted to skip breakfast than to skip dinner. You know that’s true. This usually happens because no one has the time or the right mood to prep breakfast every single morning. That’s why I believe it’s important to have a trusty list of healthy breakfast recipes that can be made ahead. The healthy breakfast is not a question mark anymore IF you take the time to prep your breakfast ahead of time. There are plenty of healthy breakfast recipes you can try to make your mornings easier and tastier. 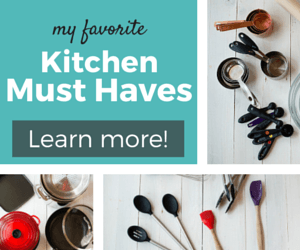 Today, I want to share one of those recipes with you. 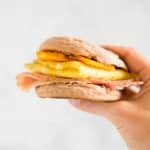 A breakfast sandwich recipe I’m sure you’ll like because it includes only breakfast-perfect ingredients. I’m talking about English muffins, scrambled eggs, ham, and cheese. YUMMY! 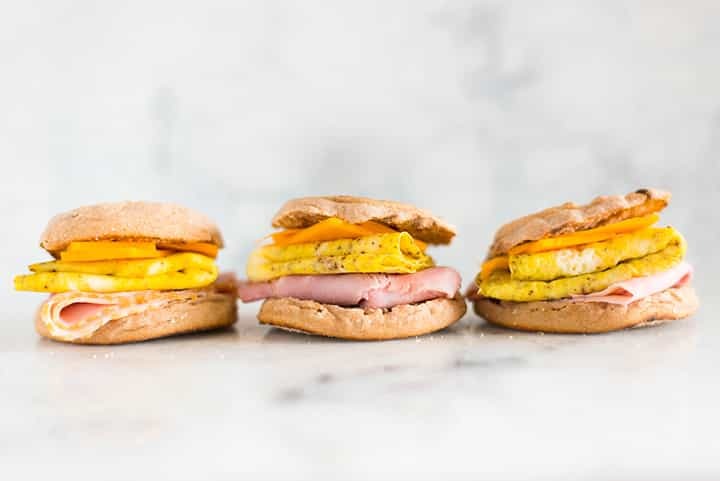 These homemade frozen breakfast sandwiches are better than the English egg muffins you sometimes buy from McDonald’s on your way to work. They are also tastier and they contain none of the processed and unhealthy ingredients like the ones from McDonald’s. Rather, they are healthy breakfast sandwiches. And you’re not gonna believe how easy they are to prep ahead and freeze. 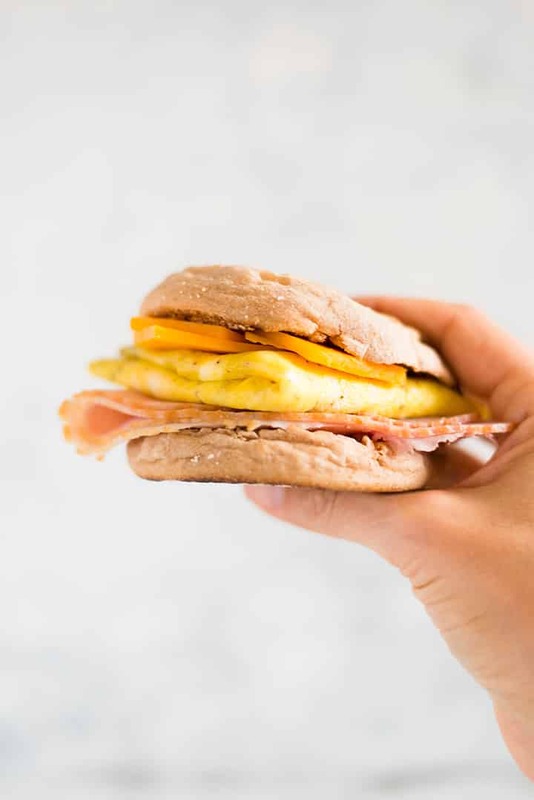 I hope you’ll add these frozen breakfast sandwiches to your list of freezer breakfast meals because they truly deserve their spot on that list. If you don’t plan your meals ahead of time and you’re counting on the fact that you can make any sandwich in less than 5 minutes, you’ll be tempted to make some bad decisions. Like throwing random ingredients you find in your fridge on a slice of bread and call it a day. Or trying breakfast sandwich recipes that are not very good for you. You don’t want that, right? Make sure you have the right type of bread. Yes, this is super important. Look for bread with the first ingredient being whole grains or whole wheat. Say NO to anything that says “bleached,” “enriched,” or “enhanced.” Also look for a minimum of 3g of fiber per serving. Most breakfast sandwich recipes require eggs. But you don’t want your eggs to be runny no matter how much you love a runny egg yolk. Those are just not good for a sandwich. Scrambled eggs are a safer bet. And I’ll teach you how to make eggs for breakfast sandwiches in a minute. Now it’s time for meat. The classics are sausage and bacon. However, low sodium, sugar free ham or turkey are healthier options so make sure you have some ham on hand. Or at least some uncured and sugar-free bacon. As far as cheese goes, you need cheese that melts well and that complements all the other flavors of the sandwich. If you make these healthy freezer breakfast sandwiches, you won’t be tempted to add unhealthy and unnecessary ingredients. Weigh the ham or the meat you’ve chosen for the meal prep breakfast sandwiches using a food scale. 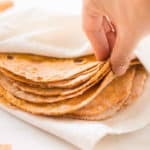 If you do this, you’ll be able to keep track of everything that you’re eating plus you’ll know for sure that all your frozen breakfast sandwiches will taste the same and are not heavy on one ingredient. Add one egg to a bowl, season with sea salt and pepper and whisk well. Heat a little bit of olive oil in a small pan. Allow the egg to cook for a few seconds. 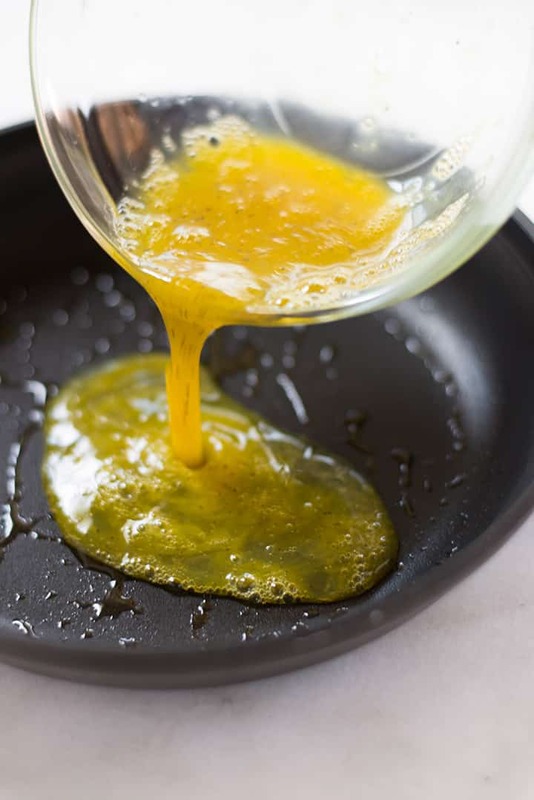 Gently tilt the pan so the egg will spread forming a circle. Let the egg cook. 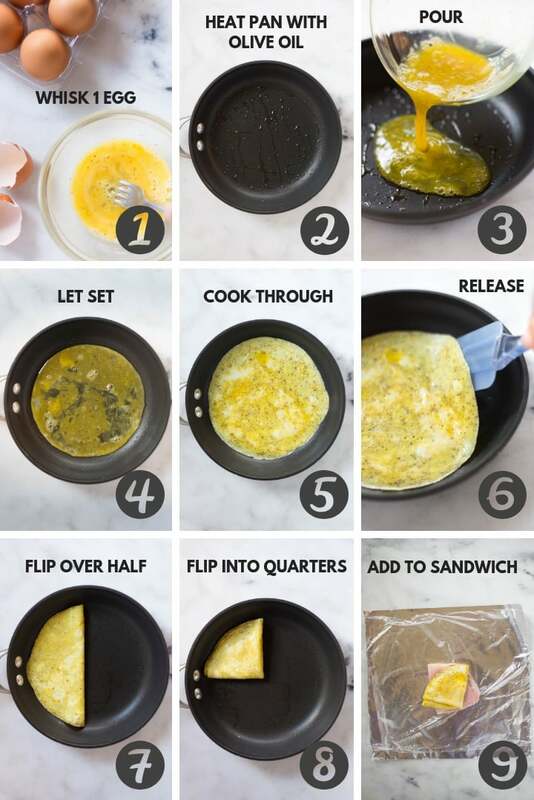 There is no need to flip or scramble the egg. When the egg is cooked, lift one corner and fold it in half. Then fold it in half another time. Transfer the egg to a plate to cool. By the way, if you want to make these healthy breakfast sandwiches extra healthy and less fat, you can use just egg whites. It will be a bit harder to fold them, though. Ok, you know how a proper breakfast sandwich looks like. 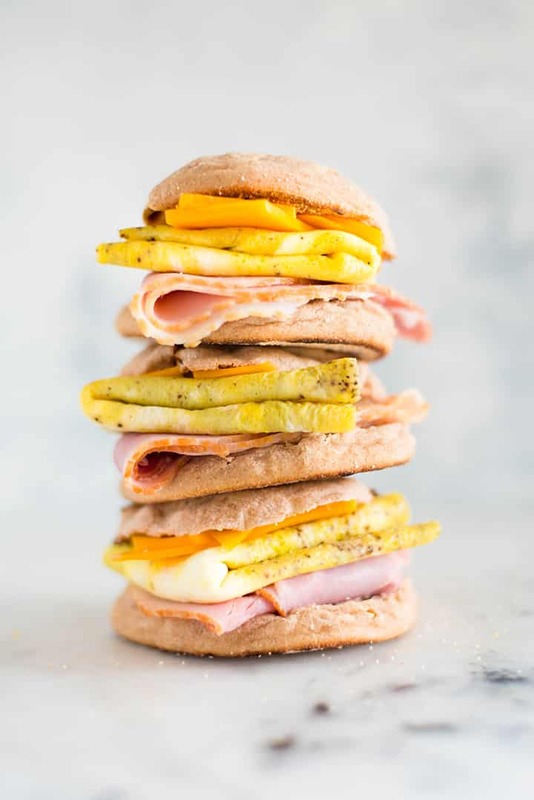 It’s time for you to learn how to meal prep breakfast sandwiches. The first thing you want to do is to prep all the ingredients. Divide the ingredients into portions to make the assembling of the freezer sandwiches easier. Lay a sheet of aluminum foil and on top of that place a sheet of plastic wrap. Add a slice of bread or bottom half of the English muffin. Add the ingredients for the frozen breakfast sandwiches in the following order: ham, scrambled eggs, cheese. Add spices, veggies or other ingredients now if you want. Top with another slice of bread or the other half of the English muffins. 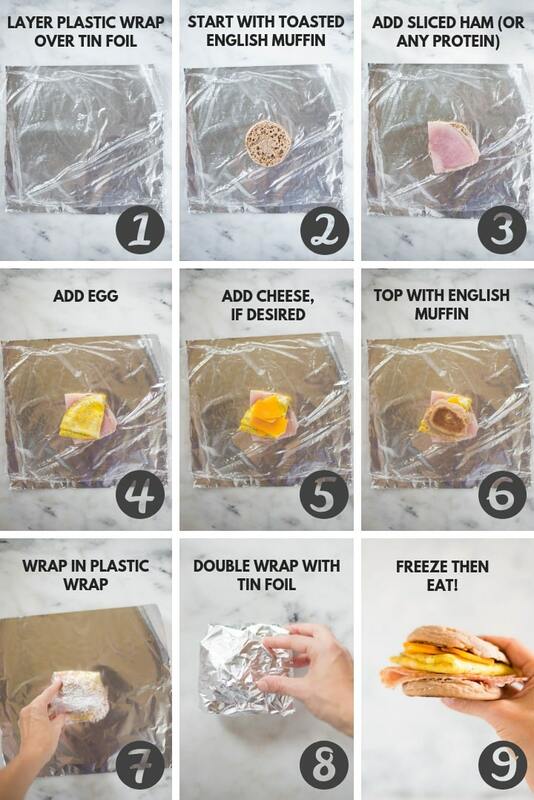 Wrap the breakfast sandwich tightly in plastic wrap. Repeat with the remaining ingredients until all your freezer breakfast sandwiches are ready. After you prepped all your breakfast sandwiches, it is time to freeze them. Learning how to freeze breakfast sandwiches is super easy. Place the freezer bag or container in the freezer. 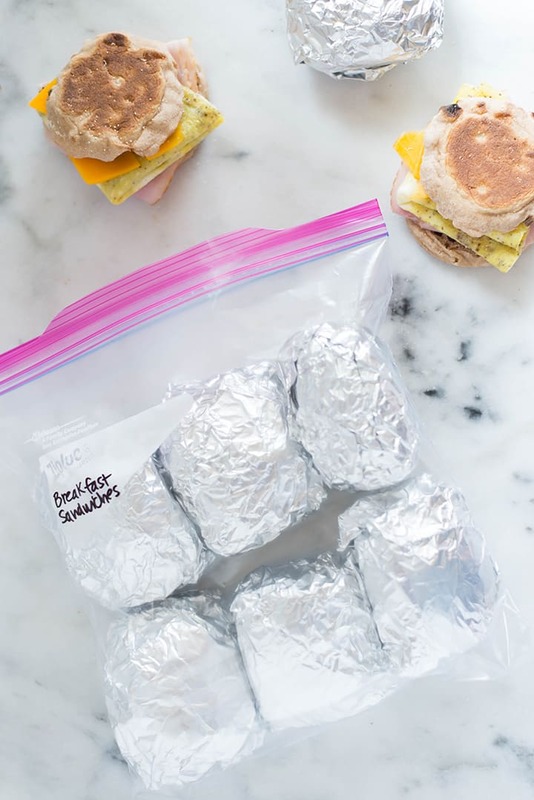 Store the freezer breakfast sandwiches in the freezer for up to 3 months. Now you can enjoy a make ahead egg sandwich whenever you feel like it. 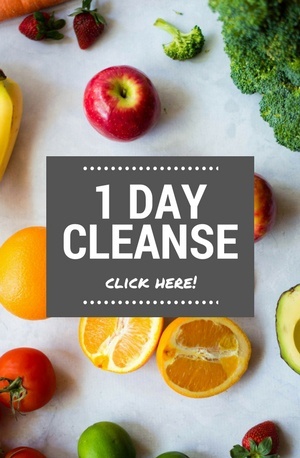 Before I move on to other healthy breakfast recipes, I have one more thing to tell you. I have to tell you how to reheat the frozen breakfast sandwiches. Reheat the frozen breakfast sandwiches in the microwave. Microwave for 1 1/2 minutes on high until the sandwich is hot all the way through and the cheese is melted. 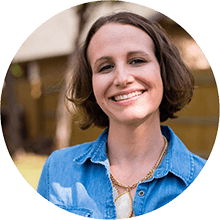 Reheat the frozen breakfast sandwich in the oven – place the breakfast sandwiches in the oven for up to 15 minutes at 350 degrees F. Check to see if the cheese is melted and the sandwiches are warmed through. Super important – don’t forget to unwrap the sandwich from the aluminum foil and the plastic wrap when you’re reheating. 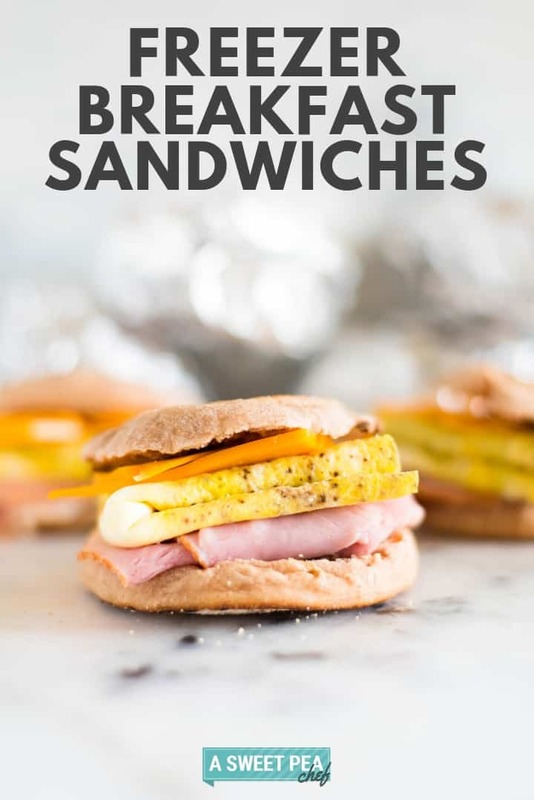 That’s it for these freezer breakfast sandwiches but don’t go anywhere because I have more healthy breakfast recipes for you. 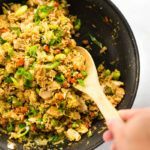 All of these breakfast recipes are great for meal prep, healthy, delicious, and very easy to make so you really have to stick around for a couple more minutes. These Frozen Breakfast Burritos are high in protein and fiber and they will give you energy for the entire day. Ok, maybe just until lunch but they are still super amazing. 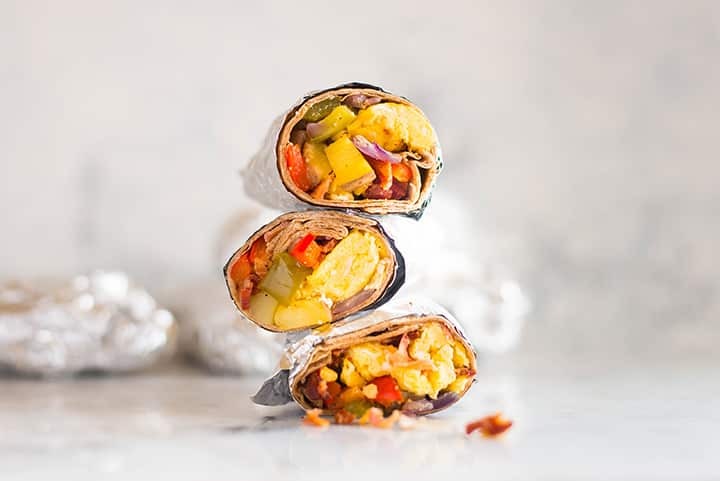 As for the ingredients used in these Frozen Breakfast Burritos, I have to say that you will love the roasted veggies and scrambled eggs wrapped in a delicious tortilla. What’s not to love about that? Get the recipe. 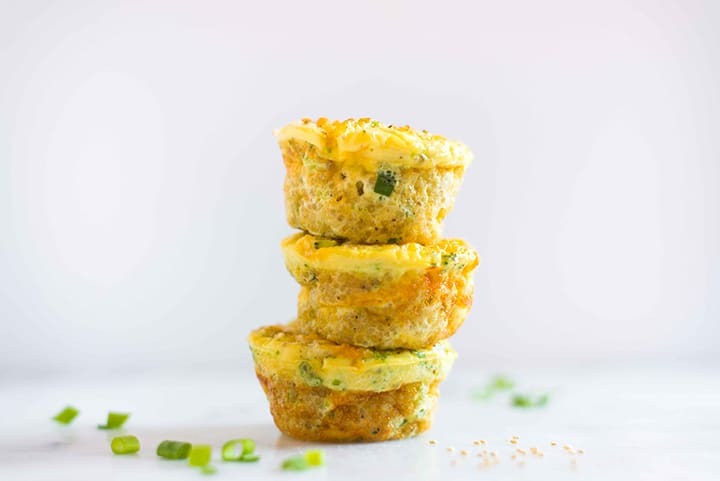 Healthy Egg Muffin Cups – another healthy breakfast option that is great for meal prep. And another egg-based breakfast that is delicious and anything but boring. 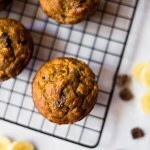 Extra points – the muffins are really cute and kids adore them. Get the recipe. And lastly, I have to teach you How to Make Protein Pancakes because everybody loves pancakes but not everybody can tell you how to make them healthy and packed with protein. 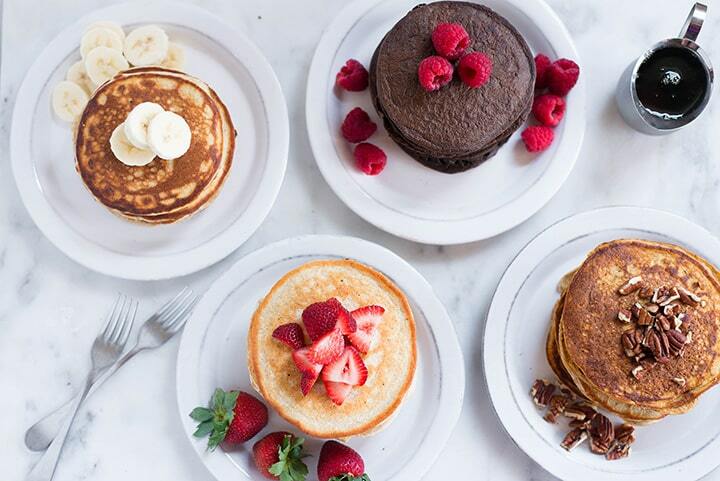 Besides the tips that will teach you How To Make Perfect Pancakes, I also have 4 Easy Protein Pancake Recipes to get you started. Get the recipes. Toast the english muffins, then set aside. For each sandwich, I make one scrambled egg and then fold it into a small omelet shape. 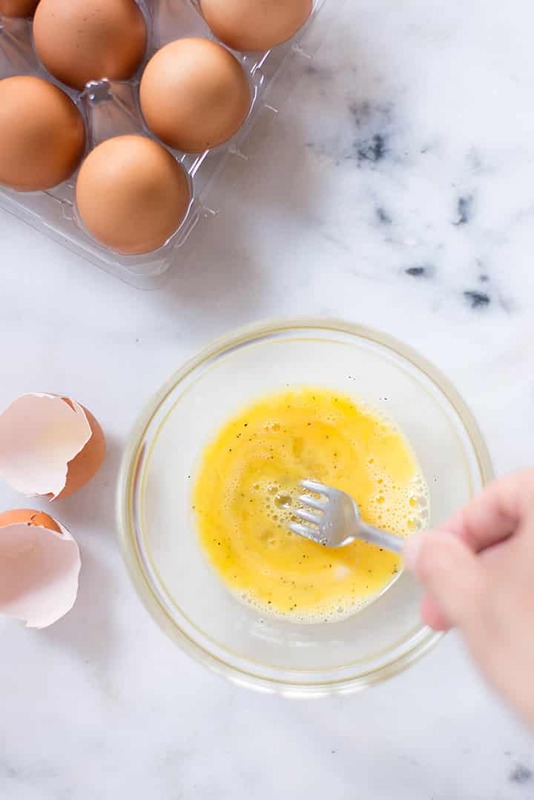 To do this, I add one egg to a small bowl, followed by a little sea salt and black pepper and then I whisk it really well, just like you would an omelet. Heat just a tiny bit of oil over medium heat in a small pan, and then pour in the scrambled egg. Allow it to sit for a second, and then gently till the pan so the scrambled egg spreads all across the bottom of the pan, forming a circle. Then, let the egg cook completely - no need to flip it or scramble it. Once the egg is no longer giggle or shiny, carefully lift up a corner of the egg and fold it in half, then fold it in half once again. Transfer this egg to cool and repeat with the remaining eggs. To assemble the sandwiches, lay out a square sheet of aluminum foil and then layer on top of that a sheet of plastic wrap. Lay down the bottom half of the toasted whole wheat english muffin, followed by the sliced ham (divided into roughly 2 oz. portions), folded fried egg, and then the sliced cheese (divided out into roughly 1/2 oz. portions). Top it all off with the other half of the english muffin and then wrap the sandwich tightly in the plastic wrap, then again tightly in the foil. Then, repeat with the remaining ingredients. 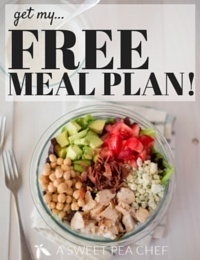 Place the sandwiches into a 1-gallon size freezer safe bag or storage container, and then place into the freezer for up to 3 months, making them an awesome make ahead breakfast option. 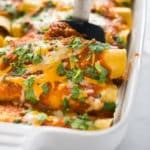 When you’re ready to eat, just remove from the freezer, unwrap the sandwich from the foil and plastic wrap and microwave on high for 1 to 2 minutes, until it’s warmed through and the cheese is melted, or you could heat them up in the oven at 350°F for about 12 to 15 minutes. Do you wrap the sandwiches in a paper towel before heating in microwave? How about the breakfast burritos, wrap in paper towel too? Thank you. I’m planning on doing these this weekend.